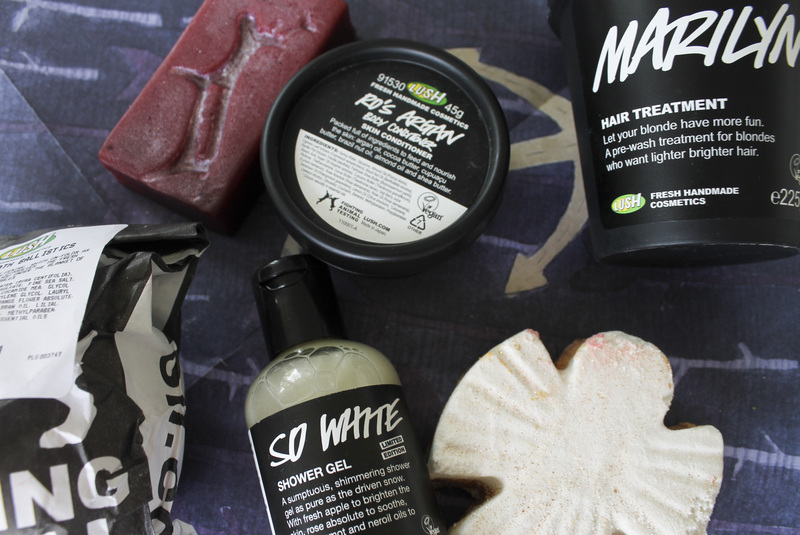 My Lush Pamper Night Picks | emma etc. I have been utterly obsessed with Lush recently. It's gone as far as to say several Lush workers recognise me in multiple stores when I go in (often). I have a problem. But it's a good problem, because Lush products are to die for. Here are some of my faves recently for a lovely pamper evening in the bath + shower depending what you like best. Marilyn Hair Treatment: The most important and first step of my routine consists of putting in this lovely hair treatment to brighten and soften my blonde hair. I can't get enough of this, and with it being half price during the boxing day sales I purchased a back up. You can leave their hair treatments on for a couple of hours or twenty minutes minimum. Have a bath while this is sinking in and then wash off in the shower! So White Bath Bomb: This joins my list of favourite Lush bath products as it smells absolutely DIVINE (like apples) and makes your skin soft and lovely. There's just something about this one that I love! Obviously if you haven't stocked up, Lush's Christmas products won't be available anymore, but look out for their mid-winter Christmas if you live in New Zealand or Australia. So White Shower Gel: This stuff smells just like the bath bomb and is addictive! I know some people probably wouldn't be the biggest fan of the scent, just because it's quite unusual, but if you're into fresh smelling scents then this is the one for you. Ro's Argan Body Conditioner: This stuff is pretty amazing come time to get out of the bath or shower. Apply all over body just before you get out (leave on for a minute) then lightly wash off and step out. Your skin will smell gorgeous and will be feeling mighty soft and supple.